Hi, everyone! How was your weekend? Congratulations to everyone who raced this weekend! This past week was just another week of base building for me, although admittedly I did not run as many miles as I intended at the start of the week. My goal for these next couple weeks is to build up my mileage a bit more before I formally begin training for the Lake Sammamish Half Marathon. Monday: AM: 8 miles moderate, 8:10/mile average pace; PM: 30 minutes kettlebell. We had our first frost on Monday morning, which meant the end of running shorts weather! When we moved to Seattle I almost donated my running tights, since I wasn’t sure if I would need them, but I’m happy that I kept them because it does still get chilly here! Temperatures in the 30s are still quite chilly, and I personally disdain running in capris—they never seem to stay put—so I’m either in shorts or full length leggings. I’ll take all of the days in the 20s and 30s, though. A Facebook memory popped up and reminded me of just how cold it was back in Valparaiso: 1 degree Fahrenheit at this time last year. Nope, I don’t miss that at all. Tuesday: AM: 7 miles fartlek run on the treadmill, 0.5-2% incline; PM: 30 minutes Pilates. 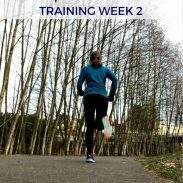 I repeated the same fartlek countdown workout as last week, except I slightly increased my paces this week. I began at a 7:40 min/mile (7.8 mph) for the first interval and worked down to a 6:30/mile (9.2 mph). 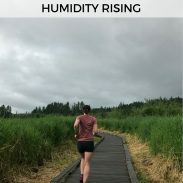 This workout makes an hour on the treadmill fly by, which I was grateful for; it was dangerously windy in the Seattle metro area (gusts at 50+ mph), so I had no choice but to run on the treadmill. 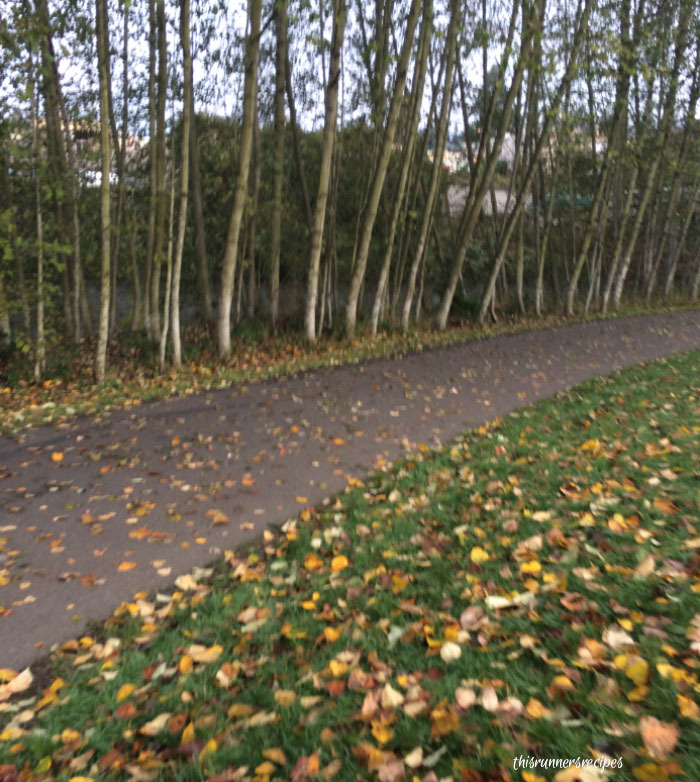 The treadmill was certainly the smart choice; on Wednesday there were several large felled trees along my favorite trail. Since we booked our trip to London last week, I realized I had to change my name on my passport. It’s been 14 months since we got married and I changed my name on everything except for my passport. I was a bit disappointed that I can’t keep my old passport with all my stamps from my semester abroad in Europe, but I’m excited to start filling up this one. For my Pilates workout, I combined some of my favorite exercises for just a sort of free-style Pilates workout. This was really fun and made the workout fly by. 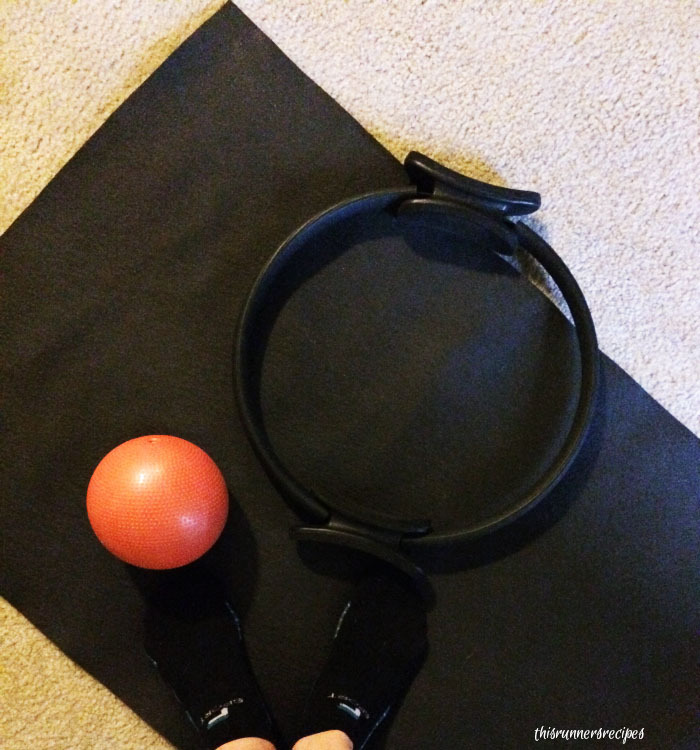 I used both my toning ring and a small weighted ball to add an extra strengthening challenge. Wednesday: 6 miles easy, 8:41/mile average pace. The sun came out on Wednesday for the first time in what seemed like weeks! I haven’t been wearing sunglasses on my runs and was practically blinded by the sun…until I suddenly ran into a dense fog. This run was just an easy run: easy pace, easy breathing, easy mileage, nothing too remarkable. Thursday: 4 miles with Charlie, 9:07/mile. I work up with a big old case of the blahs on Thursday morning and immediately wanted to go back to bed. It was one of those days where I just felt tired for no reason and completely unmotivated. 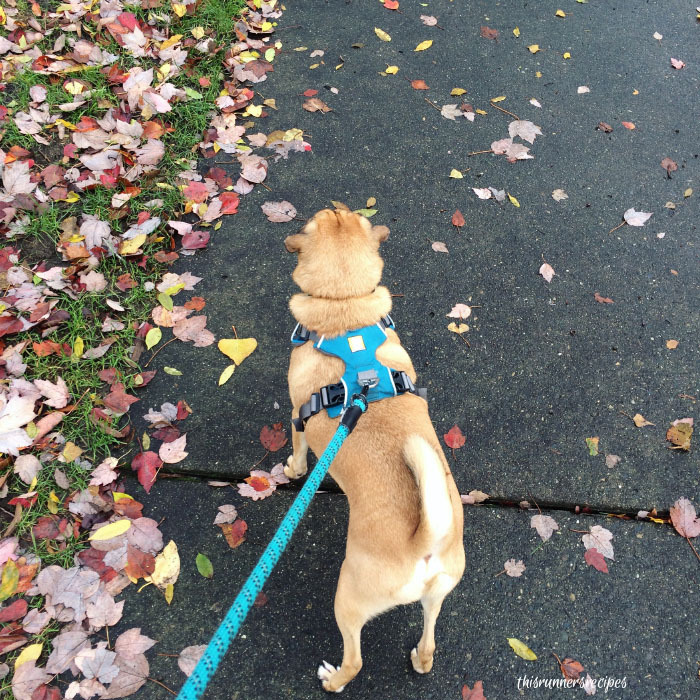 Still, I knew a run would make me feel better and that Charlie enjoys his weekly runs, so the puggle and I headed out mid-morning for an easy 4 mile run together. The run really helped boost both of our moods and Charlie is definitely increasing his endurance. Friday: AM: 6 miles hilly (~410 foot gain), 7:55/mile. I haven’t run hills since a couple weeks before the Portland Marathon, but on Friday the mood struck me to finally do so. There’s a route near me that’s essentially just over 1/2 mile of climbing, so I ran to the hill, ran up and down it four times, and then ran around my apartment complex to cool down. It was chilly outside (in the 30s) with cool air and little humidity. That’s the magic temperature for my legs to move fast and I clocked the last 4 miles at a 7:45-7:50/mile, which are the fastest splits I’ve seen since marathon training. It’s runs like this that make me think that maybe, just maybe, some day I could conquer the hills of the Seattle Marathon. I claim that I don’t want to ever run that race because of the brutal hills downtown, but a late fall marathon in gloriously chilly temperatures is tempting. Maybe all this hiking and hill running will turn me into a true PNWer who eats hills like candy. I can aspire, right? Saturday: 6.5 mile hike, 1800 foot gain, in the snow. 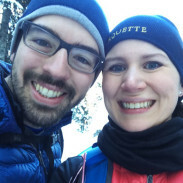 My mom sent us our Christmas gifts and let us open one of them, our trekking poles, early, so we headed out for a snowy hike at the appropriately named Snow Lake. 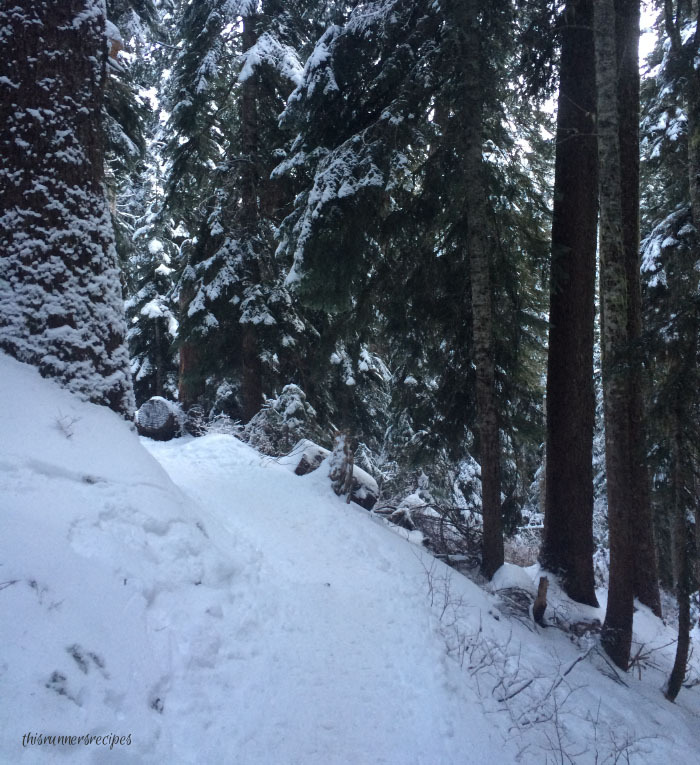 I’ve never been a fan of snow, but the snow along the trail was so powdery and light, the air felt so cool and good, and the views were so breath-taking that Ryan and I both loved hiking in snow. It was seriously so much fun, and quite the workout! Rest in only the “no workout” sense of the word: we attended a new member reception at our parish, sold the treadmill that had been taking up space since we moved to Bothell back in May, and set up a home office. What’s a running/fitness aspiration that you currently hold? 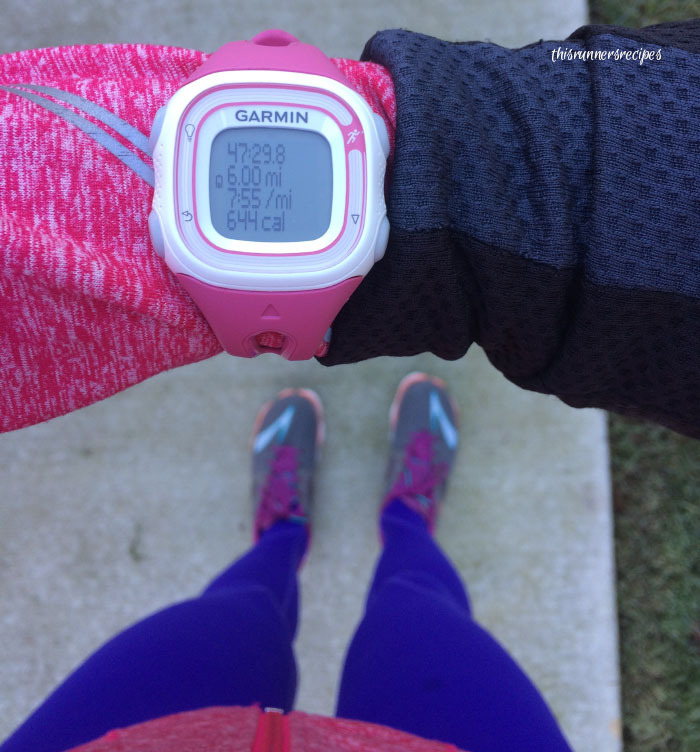 Do you love or hate running in cold weather? If you practice yoga or Pilates, do you always follow a video/class or do you sometimes make up your own routines? It doesn’t get cold here in Charleston. Well, it’s 35ish degrees right now, but to me that’s still not very cold considering it’s 5 AM and gonna warm up into the mid-50s today. I don’t own running tights but we don’t really need them here. I don’t mind running in Charleston Cold haha! You should definitely attempt the Seattle Marathon- looks like you’re a good hill runner and definitely strong. I do yoga but I always go to a class rather than just making stuff up or even doing online classes. The instructor being there is a big part of my motivation. Charleston cold sounds pleasant! It sounds like it’s shorts running weather all year round! And thank you! I would never consider myself a hill runner, so that means so much to me! I like the cold weather to a certain point. 20s and 30s can be perfect if there is no wind! I was worried about my race yesterday because it felt like 21 at the start, but it actually worked out to be perfect racing weather except for some wind at the end. I do think its a nice break from the heat, that’s for sure! It sounds like you did have perfect racing weather except for the wind (and congrats again on the PR)! The wind really does make it feel so much colder than it really is. I agree – 20s and 30s are much better than racing in the heat! Great week of running girl! You’re absolutely crushing!! I’m just getting the itch back to start running again… I’m hoping this week I can start building up my milage again. I miss those double digit weekend runs! Thank you so much, Jamie! That’s so good that you’re feeling that itch to run – good sign of recovery! I hope you get back to building your mileage this week! 🙂 I miss double digit runs also and hope to add them back in soon – they’re so nice in the colder weather. I haaaaaate running in the cold. Once I get cold, it’s impossible for me to warm up. And I haven’t found a pair of gloves or mittens that actually keep my hands warm. I need to change my name on my passport too! Thanks for reminding me! I totally get you on not warming up – I turn into a popsicle if I don’t shower right after a cold run. It’s so hard to find warm gloves – my fingers froze while hiking and took way too long to warm up. Have you tried hand warmers? We bought some for cold weather hiking and I bet they could work for running also. Thank you! 70 degrees and snowy would make the snow feel a lot better! 🙂 I’m such the opposite – I like the cold but running in the snow because I worry about falling. I wish they could just change the name part and keep the stamps – it would be so easy to do that!